A prominent leader of the “alt-right” left a Hillel rabbi speechless when he drew a direct parallel between white supremacy and Zionism — igniting debate on social media about whether such a comparison has any validity. Richard Spencer, who leads the white nationalist National Policy Institute, appeared at Texas A&M University in College Station, Texas on Tuesday night. Hundreds of students protested outside of the event, while others stood silently with raised fists inside the hall. Spencer went on to argue that Jewish continuity is predicated on resistance to assimilation. He framed that cultural imperative as similar to the movement for so-called white rights in the U.S.
Rosenberg later acknowledged that the confrontation wasn’t his best moment. Click Here to sign Enlace's Petition! On December 15, the Portland City Council will vote on whether to stop investing in the banks financing private prisons and the Dakota Access Pipeline, and Caterpillar for its destruction of indigenous land and involvement in human rights abuses in Standing Rock and Palestine. The companies involved in destroying our communities are the same. Our struggles are united. Join us in raising a single voice to City Council: uphold human rights and add Wells Fargo, Caterpillar, JPMorgan Chase, HSBC, and Bank of NY Mellon to the city's do-not-buy list. 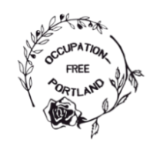 As taxpayers and residents in the City of Portland, we demand that the City immediately stop our investments in the finance industry and Caterpillar that are complicit in tearing apart our families and criminalizing our communities, destroying Palestinian communities, desecrating sacred lands and indigenous sovereignty, and threatening all of our water.